In the Spring time, by February or March, we start to get fed-up of the cold days of winter and we begin to look ahead to summer warmth and flavours. Today we can buy what used to be seasonal food, like summer strawberries, in the dead of winter but do we really want to? So for our Spring baking recipes we’re offering you a choice of seasonal food with citrus-based cakes as well as traditional Welsh cakes and, of course, a chocolate cake, which goes down well at any time of the year! Preheat the oven to 180ºC, gas mark 4. Grease and line an 8” tin. 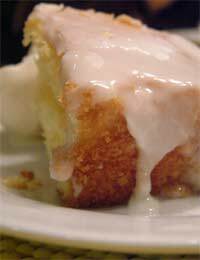 Cream the margarine, lemon rind and sugar together until light and fluffy. Add the eggs gradually. Fold in the sieved flour. When thoroughly blended, pour the mixture into the tin and bake for about 1 hour or until golden-brown. Meanwhile make the syrup. Place the sugar, lemon juice and water in a small saucepan. Heat gently, stirring, until the sugar dissolves. Let it bubble for 1 minute. Allow to cool slightly. When the cake is cooked, turn out immediately onto a plate with a raised edge. Using a skewer make small holes in the cake and gently spoon over the syrup. Allow to stand for the syrup to soak in. Preheat the oven to 150ºC, gas mark 2. Grease and line an 8” tin. Sieve the flour and bicarb together then, in the order listed mix the ingredients together. Pour into the tin and bake for 1½ hours or until well-risen and golden-brown. Remove from the oven and spread the top with marmalade and sprinkle with flaked almonds. Return to the oven for 5 minutes. Leave to cool, in the tin before turning out. Sieve the flour, cocoa and bicarb together then, in the order listed mix the ingredients together. Pour into the tin and bake for 1½ hours or until well-risen and firm to the touch. Remove from the oven, sprinkle with chocolate chips and leave to cool in the tin. From an old Welsh recipe, these flat sweet cakes are often made for St. David’s Day in March. For this you need a griddle or thick-based frying pan. Sieve together the flour, baking powder and salt. Rub in the margarine using your fingertips until you have fine crumbs. Stir in the sugar and sultanas. Make a well in the centre and add the egg and milk. Mix to make a stiff dough. On a floured surface roll out the dough to a thickness of ½”. Cut into circles and cook in batches on the greased pre-heated griddle for about 3 minutes a side. Place on a cooling tray and sprinkle with sugar. Eaten hot from the griddle they taste like heaven!